Mike Leigh's historical epic is an incendiary powder keg of cinema that blisters with topical anger. 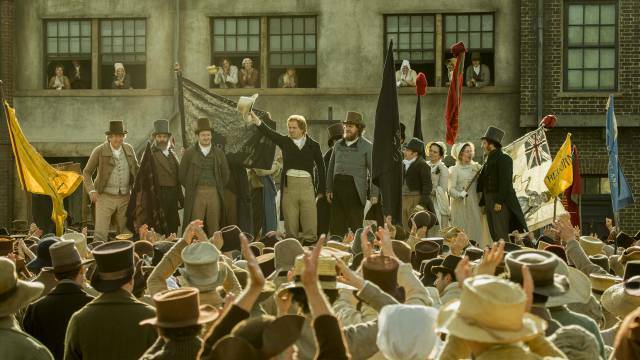 “What good is a parliament, if it doesn’t represent the people?” demands a member of the working class in Peterloo. Struggling to get by, with half of their wages swallowed by food and housing costs, they’ve had enough of being ruled by a metropolitan elite that doesn’t care about a fair society. The year is 1819, and if things are sounding familiar, that’s no coincidence. Mike Leigh’s staggering period drama is a fierce criticism of the timeless inequality in our country, an angry reminder of how the government once killed those protesting for fair democracy and a rallying cry for hope in the face of hard times. Leigh opens his historical portrait at the victory of Waterloo. But that victory came at a price: we see young man Joseph (David Moorst) standing alone in the aftermath of the battlefield, a striking red coat in a cloud of corpses. Prophetically, it’s not the first time we’ll see him in such a position. Joseph, somehow, makes his way home to the North, army uniform still on, and his fragile breakdown when he meets his mum, Nellie (Maxine Peake), is a tear-jerking introduction to one of England’s overlooked regional citizens. Things get worse from there. Unable to find a job, Joseph faces a cruel combination of difficulties. Bread has been taxed, and with a ban on importing corn, farmers are putting up prices, which is only making it harder for families mired in poverty. All the while, the well-off in London are voting to give £750,000 to Wellington as a thank-you for his wartime exploits. It’s no surprise, then, that talk of reformation is spreading. Talk turns into meetings. Meetings turn into gatherings. Gatherings turn into organised marches. And, eventually, a plan is formed to hold a large rally at St. Peter’s Field in Manchester. A peaceful call for democracy and an end to poverty, the march would end in government forces storming the event, trampling and killing over a dozen people and injuring hundreds. Leigh follows the build-up to this tragedy with an intimidating diligence, never rushing past long conversations about parliamentary process and democratic principles – and there are a lot of long conversations to be had. But while that might sound like a history lesson, it crackles with a topical relevance. The scale alone is something quietly remarkable, as Amazon Studios’ backing gives the kitchen sink drama director the opportunity to aim far bigger than he perhaps ever has: this may be a Mike Leigh film, but we see aerial shots floating out over countryside and crowd scenes that are deceptively large, despite their calm, steady editing. That wider scope brings with it a larger ensemble, which means that we don’t get as much time with each character as we’d like: Maxine Peake and David Moorst risk being lost in the fray, as we meet Joseph’s father Joshua (Pearce Quigley) and a host of other locals and campaigners, not to mention the southern privileged types, from the manipulative Home Secretary Lord Sidmouth (Karl Johnson) to the childish, self-centred Prince Regent (a scene-stealingly obscene Tim McInnerny). 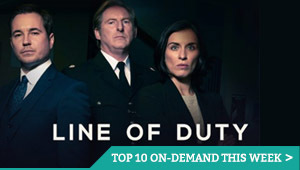 But the limited portions of screentime reinforce the sense of unity that’s required for people to make an impact on a national stage – and so Leigh’s panoramic portrait of a community of eccentrics recalls a work by Dickens or David Lean, even as we see the damage done by negligent individuals, such as General Sir John Byng (Alastair Mackenzie), appointed to oversee the cavalry in the North, but preferring to spend his day at the races instead of keeping things civil. The closest we get to a focal point is Henry Hunt, a skilled orator and a champion of reforming the voting system so that every person gets a say in who represents them in the House of Commons. He’s an intriguing juxtaposition of principle and peacockish self-regard; a man of the people, but also a man with equity and standing, the kind of person that the authorities might actually listen to, but also the kind they detest. Rory Kinnear plays him with just the right amount of arrogance, even down to his carefully maintained white hat – an entertaining contrast to the well-meaning, humble Mr. Knight (Philip Jackson), a prominent member of the Manchester Constitutional Society and a man keen to ensure that their cause doesn’t spiral into anarchic rebellion. It’s in these performances that Leigh’s strength as a filmmaker shines: he’s a master of picking out tiny details in human interactions, bringing humour to material that could have been dry in another pair of hands. He’s as happy exposing the halls of power as he is mingling with the march’s down-to-earth attendees, who chat trivially about how far they’ve all travelled to get there. But there’s a purpose behind each frame that’s closer to Ken Loach than Leigh’s Happy-Go-Lucky, combining heft with heart to shocking effect come the movie’s violent climax. The result is a film that depicts a chapter in British history that is barely taught in schools and likely unknown to those outside of Yorkshire and Lancashire. As the fight for democracy continues today, it’s a lesson that’s worth learning afresh, revising the people’s long-running struggle for compassion and integrity in the face of corruption and greed, and the need for habeas corpus and civil rights at all times. “Times are too hard to lose hope. Hope is all we’ve got,” muses Maxine Peake’s hard-working, gentle matriarch. 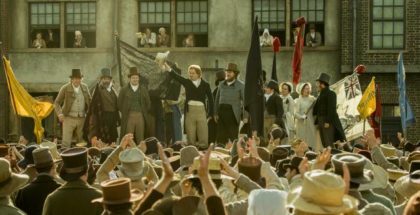 It might look like an old-fashioned costume drama, but Peterloo storms the screen with Waterloo-like gusto. This is an incendiary piece of art, a scorching powder keg of cinema.